If you are living in North America or Europe, tis the season for spotting the International Space Station (ISS)! Websites like NASA's Skywatch can tell you the viewing schedule for your area by entering a zip code. 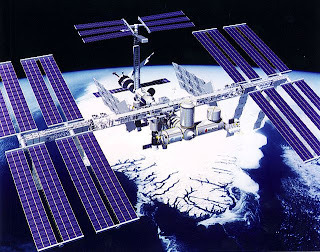 High altitude- satellites like the ISS are lit up by reflecting sunlight, making them visible against a dark night sky. Only at this time of year are the nights short enough to view orbiting objects that remain close to earth. Luckily, the ISS is enormous (when completed it will have a mass of 250 tons), making it much easier to see than most other artificial satellites. It also circles the earth about every 90 minutes, so those living in optimal locations might be able to see the station up to 6 times in one night. July 17 through the 21 is the best time frame for viewing, either 45 to 90 minutes before sunrise, or 45 to 90 minutes after the sunset, when the ISS appears at a high arc across the sky. You might even see a super-bright satellite flare, giving the impression that a trail of is light streaking across the sky.